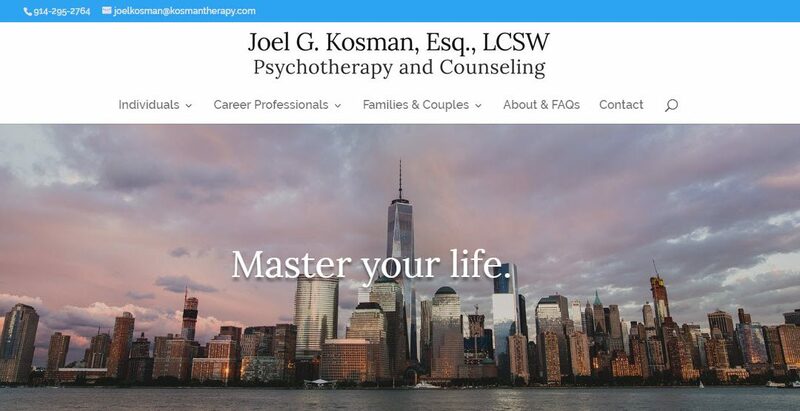 We recently completed a Weebly to WordPress migration for New York City therapist Joel Kosman, Esq., LCSW. Joel does a lot of work with professionals in New York, especially attorneys, as a legal professional himself he knows the legal field so well. Joel had created a Weebly site for himself and ultimately wanted more from his website. We created a new site in keeping with the old, but with important updates. First, the site is now secure and offers HTTPS browsing to visitors. Joel opted to host with GoatCloud and the security certificate is included with the hosting package. Next, the site is very mobile friendly. It “responds” to screens of all sizes, looking good on any. It’s especially important that a site look good and function well on mobile devices. There were a lot of little tweaks that make the browsing experience more pleasant on the new site, including social sharing, faster rendering, better content formatting, and greater design flexibilty. Important to any website conversion are 301 redirects. We created a table mapping old URLs to new. Any attempt to visit old site pages will automatically take the visitor to the corresponding page on the revamped site. Absent that, visitors would confront the dreaded 404 “page not found” error message. Visit Kosman Therapy online here: https://kosmantherapy.com.